In Hinduism, Parvati is the wife of Lord Shiva, and the gentle aspect of Mahadevi, the Great Goddess. Parvati is mother of the gods Ganesh and Murugan, and according to some Hindus, is also the sister of Vishnu. When depicted with Lord Shiva, Parvati is generally shown with two arms. When depicted alone, Parvati is depicted with more arms, often four or eight, and usually sitting astride a lion or tiger. Parvati has many incarnations, and though considered generally benevolent, does have both benevolent and wrathful incarnations. This majestic sculpture of Goddess Parvathi shows her standing in the eleganttribhanga posture. In this particular posture of the goddess, the head, torso, and legs, all slant in contrary directions. The legs and hips jutt tothe right, the trunk to the left, and the neck and head then again gently tothe right. It is a lyrical, dreamy, very graceful pose. The three curves formed by the body symbolize the three worlds, upper, lower and middle,better known in Sanskrit as triloka. This is also popularly known as theposture of three bends.One hand of the goddess is extended in a posture of ease and the other is raised. On her head is a karanda-mukuta (cone-shaped crown) at the center of which is a flaming pearl. She wears a couple of necklaces, the longer of which is strung with a central pendant. A sacred thread slithers between her sharp and shapely pointed breasts. Her elegantly draped lower garment,incised with horizontal lines, clings closely to the contours of her limbs,held in place by an elaborate girdle. Full color three dimensional sculpture. Shiva means "auspicious" and he is also known as Ashutosh or one is easily pleased and will quickly bestow boons or fulfill requests. Parvati, the wife of Lord Shiva, is the goddess of success, prosperity, and abundance. She is worshiped by married women for a happy married life. Ganesh is the ever-blissful, elephant-headed demigod, who is lovingly worshiped and revered by millions of people worldwide. The son of Shiva and Parvati, Ganesh, is the demigod of good luck and auspiciousness and the dispeller of problems and obstacles. Kartikeya is the demigod of war, born for the purpose of defending the rest of the demigods against the onslaught of the demons. 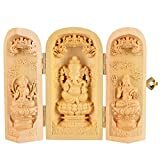 This is a wood statue of Parvati, Ganesha and Shiva.